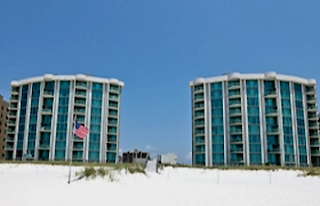 Gorgeous Perdido Towers Condo for sale in Perdido Key Florida - beachfront residence with floor-to-ceiling windows that provide exceptional views of the white-sand beaches and emerald waters of the Gulf of Mexico. This home has an open-design, granite counter-tops throughout and neutral color palette. This resort property has 2 balconies, one facing the beach to the south, and one facing Ole River to the north. The amenities at Perdido Towers include 400-feet of beachfront, swimming pool, community room, exercise facility, boat docks and tennis courts...an ideal resort home for enjoying coastal living with family & friends.